Baylor's School of Engineering and Computer Science (ECS) is a remarkable place to work. As an exciting hub of cross-disciplinary research, innovation, entrepreneurship and engineering education, ECS continues to operate under the Baylor mission to integrate academic excellence and Christian commitment with a caring community. In my fifth year as Dean, I am not only encouraged by the rising quality of education that our dedicated faculty produce year after year, but also by the caliber of young men and women that our programs graduate each year. From students that design a capstone project to meet the needs of a disabled child to faculty that receive recognition as outstanding teachers, research professionals, and industry experts, ECS is ripe with accomplishments and pride. This past year, our faculty have contributed to expanding research into such areas as human-computer interaction, wireless technology, big data, polymers, and motion-capture technology. Our research expenditures continue to grow, with ECS reaching over $1.75 million in annual research expenditures this year. Our research funding supports an ever expanding graduate program. This fall, we are expecting to have over 30 Ph.D. students in our programs for the first time. Our faculty are helping Baylor in its goal to become a major research university. In addition, the momentum has begun with a strategic committee that is focused on defining our classroom, laboratory, and maker space requirements to meet the needs of our growing technical programs. In August, the Department of Computer Science moved into the Hankamer Cashion Academic Center allowing for larger classrooms and additional lab and office space for both the engineering and computer science programs. As we continue to define our space and facility requirements, we will rely heavily on the support of our faithful alumni and donors. Our donors have continued to give generously to ECS by funding scholarships, sponsoring student organizations, and participating in classroom presentations and on advisory boards. With a 22 percent female and a 33 percent minority student body, we continue to see positive changes in the diversity of our undergraduate and graduate programs, including a new doctoral program in Computer Science. The donor funding of scholarships has allowed ECS to compete with the scholarship offerings of some of our competitors. As a result, we have continued to see an increase in the mean SAT/ACT scores of incoming freshmen. 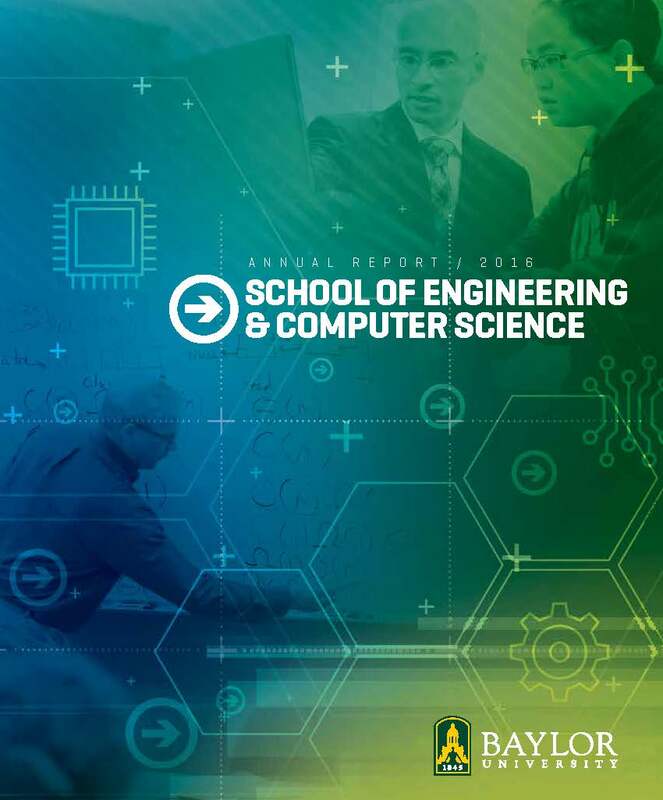 While it cannot capture everything that our faculty and students have accomplished, we hope that our 2015-2016 annual report gives you a snapshot of the great things that are happening at the School of Engineering and Computer Science and keeps your eyes on the future of our budding programs. Dennis L. O’Neal, Ph.D., P.E.